Gone are the days of film when everyone was happy posing for family portraits and taking snapshots of almost anything before flocking to their favorite film developer to have the images in print. With today’s technology, everything has turned digital. With even a budget smartphone, one can readily take snapshots or well-themed pictures of objects, sceneries, or plain human activities and have these stored for a lifetime to enjoy. Unfortunately, the memories of the past are truly meaningful especially those in the period of the black and white. While there is a process of converting old photographs into digital formats and the conversion of slides and negatives into digital images, the whole process is very tedious. If done professionally, you could literally end up bankrupt. Good thing there is the ClearClick Virtuoso Film and Slide Scanner. This device effectively revolutionizes the whole endeavor of digitalizing old pictures, films, negatives, and slides so that these can be immortalized and not lost forever. Individuals who will benefit the most from the ClearClick Virtuoso will be those individuals who have boxes upon boxes of old films, negatives and slides. Grandparents who may wish to see their adventures in the 50s to the 70s would be well-pleased to find the Virtuoso as the solution to their problems. Additionally, individuals who are in fields that require archiving of important film and slide resources such as librarians, historians, anthropologists, and other members of the scientific community can find the versatility of the ClearClick Virtuoso as something that is truly beneficial to their work. 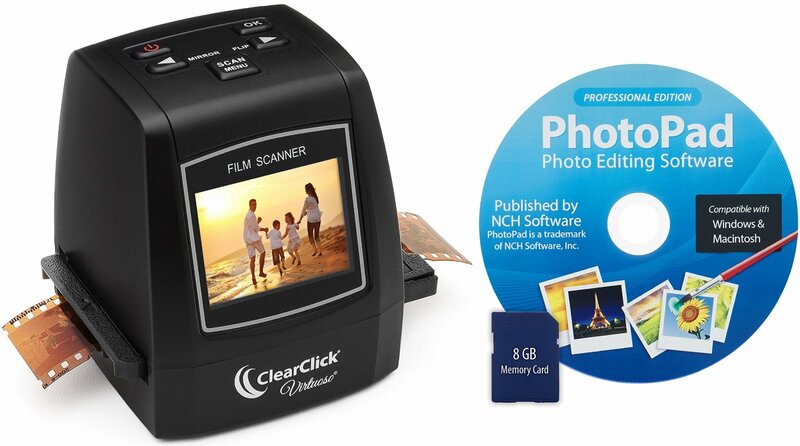 One of the most significant strengths of the ClearClick Virtuoso is its ability to convert a wide variety of film formats including the motion picture film format Super 8, the cartridge-based 110 and 126 films, and the standard of chemical still photography and motion picture films, the 35 mm. It also provides excellent conversion of slides and negatives. This should be a welcome development for librarians who may have an extensive collection of microforms in their archive sections. Biology, histology, microbiology, and even parasitology teachers and professors may also have boxes upon boxes of slides containing images of biological samples. Getting the Virtuoso should bid them well in converting these priceless learning materials into digital format where it can also be enhanced properly for future use or for proper and more systematic archiving. People with these films, particularly the 110s and the 126s will find it great to once more relish their pictures in full digital glory. The ClearClick Virtuoso is a standalone technology. You don’t need a computer or any other device to convert films, negatives, and slides. This simply translates to ease of use and absolute convenience. While it only has a standard 128 MB of memory, the storage capacity can be expanded with the use of an 8 GB SD card. There are no indications as to the maximum amount of storage media that can be fit into the device but, if this scanner were at par with current standards, then it should be able to carry a maximum of 32 GB. This is good news for people who may have tons and tons of photos they need to digitalize. An 8 GB of storage space can easily store more than 2,000 high quality, high resolution images at 22 megapixels. The Virtuoso also comes with its own unique PhotoPad Photo Editing software so you can make the necessary image editing without the need to install other image editing software like Photoshop CS, Elements, or Lightroom; although, for professional editing, you definitely would want these applications. Nevertheless, edited or not, you can view the scanned and converted images from the Virtuoso directly to your television set with its TV-out cable which already comes supplied with the package. It is quite difficult to pinpoint a major drawback from the ClearClick Virtuoso. Perhaps one gripe will be the limited film formats that it can scan and convert. For example, it does not handle the standard 8 mm film format nor the 127 roll film format. This means that it will not be able to handle films or photos that were taken earlier than 1960 as Kodak only began releasing the Super 8 in 1965 and the 126 in 1963 although the 35 mm was introduced in 1892. The 110 film was introduced in 1972, also by Kodak. The 127 was introduced in 1912 while the standard 8 mm film format was introduced in 1932 and is still manufactured to this day. Technically, it is a very minor weakness considering that majority of people still very much alive today have either used the 35 mm or the 126, 110, and the Super 8. Maybe those that will be at a disadvantage will be individuals who had photos taken from 1912 to the 1960s using the 127 or the standard 8 mm format. For people with the 127 or standard 8 mm film format, they may opt for the Wolverine F2D Mighty Converter. The device includes conversion of Standard 8 and 127 into digital formats. Unfortunately, the maximum resolution it can provide is only 20 megapixels compared to the Virtuoso’s 22 megapixels. Additionally, while the Wolverine F2D Mighty also allows for convenient TV-out viewing, you will have to buy your very own TV-out cable. You also need a third party software to perform some post-conversion editing, something that ClearClick Virtuoso already supplies. The prices of these two units are pretty close so that gives the Wolverine an advantage for the 2 additional formats it offers if those are formats you need. The other contender is the Jumbl Film and Slide Scanner. It is a bit more expensive and with the ability to convert only 35 mm film and slide formats, this is a very pricey alternative. The standard resolution is 14 megapixels but can be bumped to 22 MP using its built-in image interpolation software, meaning it will have to convert the standard 14 MP into a 22 MP image. Unlike the Virtuoso that scans directly in 22 MP, the Jumbl gives you the choice if storage is a concern. 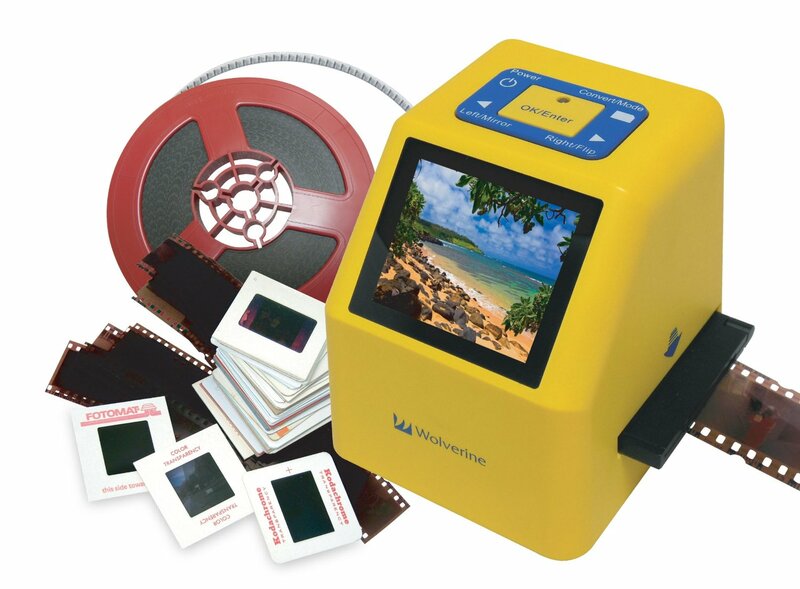 The ClearClick Virtuoso provides just the right solution for the most common slide and film format that many people have. It is competitively-priced so it should not be a major problem. It is a newer model but the early reviews are mostly positive.